Why choose All About Water? All About Water provides only premium services and comprehensive rental packages. We will deliver the boats and other gear to the water of your choice in and around Bonita Springs – we recommend Imperial River and New Pass Bridge on Estero Bay, Bonita Springs. If you have a request for a location outside Bonita Springs, please let us know. We will work to accommodate you. You make reservations online so there is no need to come to our facility! That means no unnecessary trips through traffic, no looking for parking, no waiting in line – none of that stuff that wastes your vacation time! If you want to stop by our shop, on Tamiami, please feel free. We are at 27835 South Tamiami Trail, Bonita Springs, FL 34134. All About Water provides guided kayak tours within Sleeping Bear Dunes National Lakeshore, Empire, Michigan. 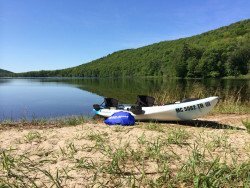 All About Water also rents, with free delivery in Leelanau County (northwest of Traverse City), kayaks, and stand up paddleboards. Please note: we are approved by the National Park Service to deliver our equipment to waters within Sleeping Bear Dunes National Lakeshore. For those of you staying at a place on the water, you also have option to have us deliver the kayaks, stand up paddleboards, and the rest of the gear to your location. If you are unfamiliar with the Leelanau Peninsula we encourage you to consider a destination there. We can suggest locations that will set you up for a successful outing no matter your experience level. In addition to the kayaks and paddleboards, what equipment is included? The kayaks are delivered to the water! You make reservations online – you don’t have to come to our facility or meet us at the water. That means no unnecessary trips in traffic, no looking for a parking spot, no waiting in lines – none of those things that waste your vacation time! New for 2017 we have shuttle vans to transport you to the up-river put-in-spot on Imperial River so you simply paddle/float down-river back to your vehicle! Vacation time is at a premium and should be used wisely, not wasted waiting for somebody else or their schedule, availability, or convenience. How does All About Water help you with this? With our delivery locations you can avoid crowds, traffic, crowded parking lots, long lines for equipment, chaos, . . . ugh! Think about that for a minute. . . . Spend your vacation time at your own pace, at peaceful locations, without rushing here and there. . . . That’s nice. Remember those other vacations when you had to schedule all the activities for the day around one activity that was only available starting in the late morning, early afternoon, or something like that? And then you ended up rushing through everything to get there, or sitting around doing nothing waiting for your appointment. Don’t do that anymore. Rent from us and enjoy this beautiful destination on your time, and at your pace. The right equipment for you, for here, for now! All About Water and our suppliers have chosen the best designs and styles for these waters and these activities. What does that mean? Visit bout Our Rental Fleet Page to learn more about our kayaks, sups and gear. View are FAQ Pages from the Navigation menu on this site for even more information about planning a trip.